I turned over to my oven after a hiatus of almost one and half years. While its a good thing for my health (and obviously my weight) that the oven was ignored, it wasn’t very good for my love for baking . I would spend time hours looking at various recipes, collecting those interesting ones, bookmarking the others – waiting for a perfect time to try them out. Only that the time never came. Planning something to cook never works in my favor. Never. Last evening, on an impulse I wanted to have chocochip cookies – sudden sugar/choc craving kicked in. Even while the fruits called on to me from the table, my mind was busy devising a plan to indulge myself with something chocolaty. And then, I happened to bake these beauties – in just about ten minutes. No exotic ingredients. No special instructions. While the sweet aroma of baking filled the entire house, I pulled out the tray of cookies from the oven. Waited just the enough time to taste the first warm cookie and fell in love with it. Pre-heat the oven at 175deg C for 5 minutes. In a bowl, mix all the dry ingredients together – maida, baking powder, salt and chocochips. In another bowl – mix oil, milk, sugar and vanilla essence together. Bring the wet mixture together with the dry mixture and mix it well. Scoop out equal portions of cookie dough using a spoon onto the baking tray. Slightly flatten the dollop of cookie dough to give it some shape. Bake for about 5-7mins or until done. Leave them to cool before removing them from the tray. 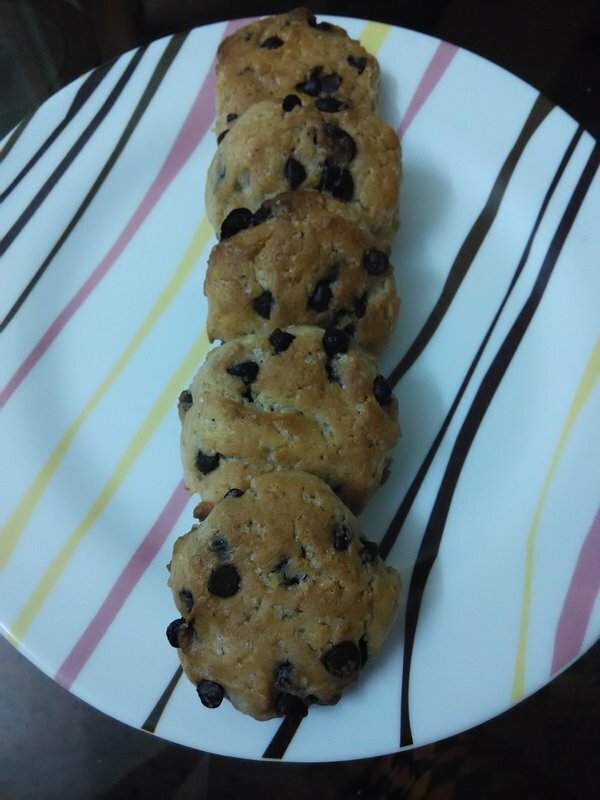 When hot, the cookies would be still soft and harden only on cooling.